Rainier is an interesting new probabilistic programming library for Scala recently open-sourced by Stripe. Probabilistic programming languages provide a computational framework for building and fitting Bayesian models to data. There are many interesting probabilistic programming languages, and there is currently a lot of interesting innovation happening with probabilistic programming languages embedded in strongly typed functional programming languages such as Scala and Haskell. However, most such languages tend to be developed by people lacking expertise in statistics and numerics, leading to elegant, composable languages which work well for toy problems, but don’t scale well to the kinds of practical problems that applied statisticians are interested in. Conversely, there are a few well-known probabilistic programming languages developed by and for statisticians which have efficient inference engines, but are hampered by inflexible, inelegant languages and APIs. Rainier is interesting because it is an attempt to bridge the gap between these two worlds: it has a functional, composable, extensible, monadic API, yet is backed by a very efficient, high-performance scalable inference engine, using HMC and a static compute graph for reverse-mode AD. Clearly there will be some loss of generality associated with choosing an efficient inference algorithm (eg. for HMC, there needs to be a fixed number of parameters and they must all be continuous), but it still covers a large proportion of the class of hierarchical models commonly used in applied statistical modelling. In this post I’ll give a quick introduction to Rainier using an interactive session requiring only that SBT is installed and the Rainier repo is downloaded or cloned. To follow along with this post just clone, or download and unpack, the Rainier repo, and run SBT from the top-level Rainier directory and paste commands. First start a Scala REPL. Before we start building models, we need some data. 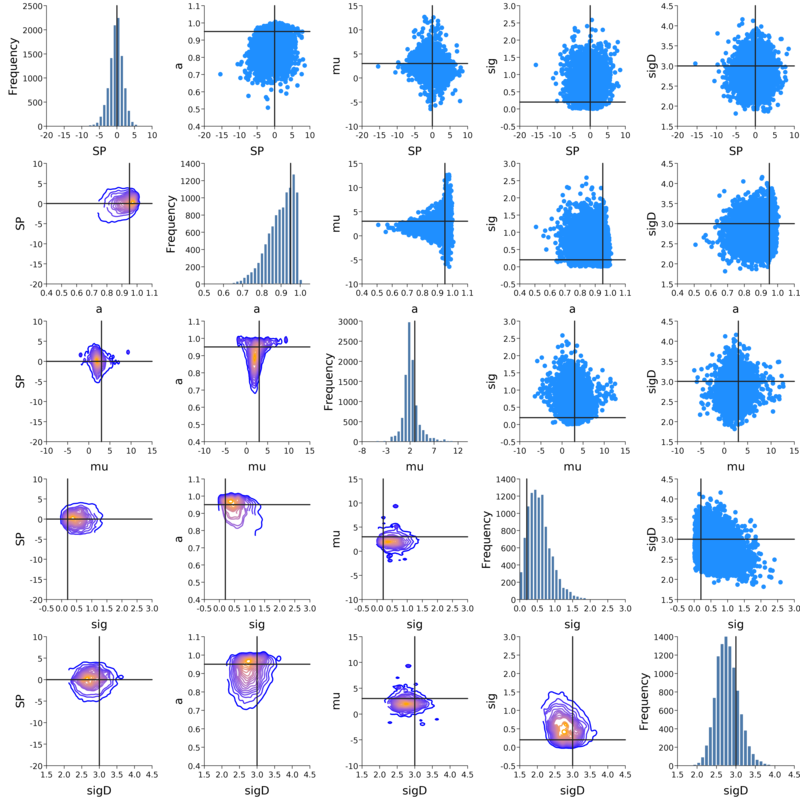 For this post we will focus on a simple logistic regression model, and so we will begin by simulating some synthetic data consistent with such a model. Now we have some synthetic data, we can fit the model and see if we are able to recover the “true” parameters used to generate the synthetic data. 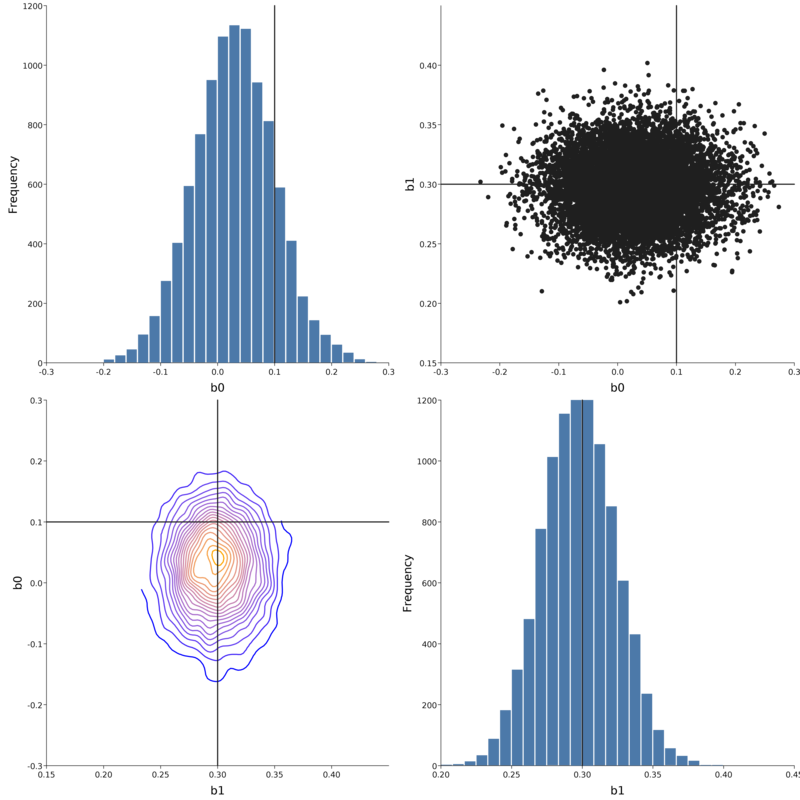 In Rainier, we build models by declaring probabilistic programs for the model and the data, and then run an inference engine to generate samples from the posterior distribution. Now we want to build a model. We do so by describing the joint distribution of parameters and data. Rainier has a few built-in distributions, and these can be combined using standard functional monadic combinators such as map, zip, flatMap, etc., to create a probabilistic program representing a probability monad for the model. Due to the monadic nature of such probabilistic programs, it is often most natural to declare them using a for-expression. This kind of construction is very natural for anyone familiar with monadic programming in Scala, but will no doubt be a little mysterious otherwise. 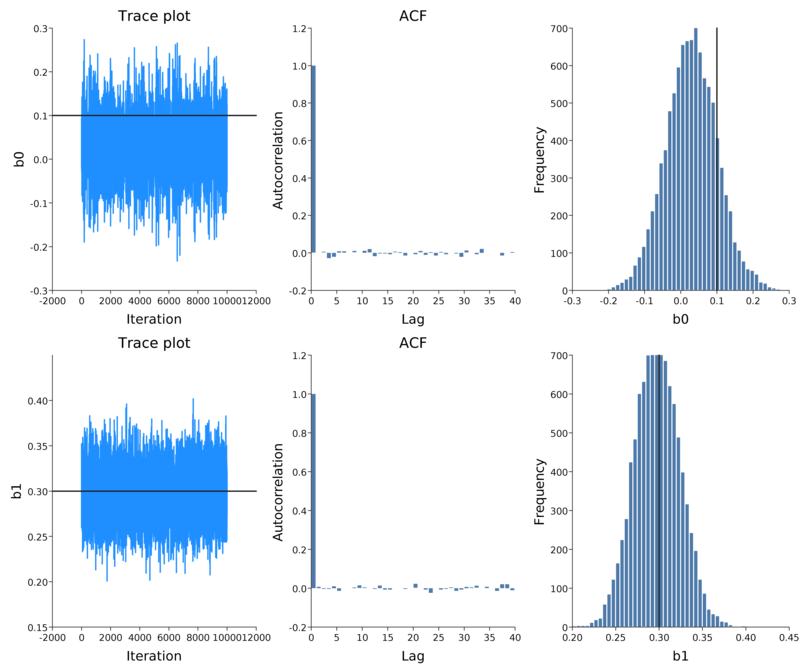 RandomVariable is the probability monad used for HMC sampling, and these can be constructed from Distributions using .param (for unobserved parameters) and .fit (for variables with associated observations). Predictor is just a convenience for observations corresponding to covariate information. model is therefore a RandomVariable over beta0 and beta1, the two unobserved parameters of interest. 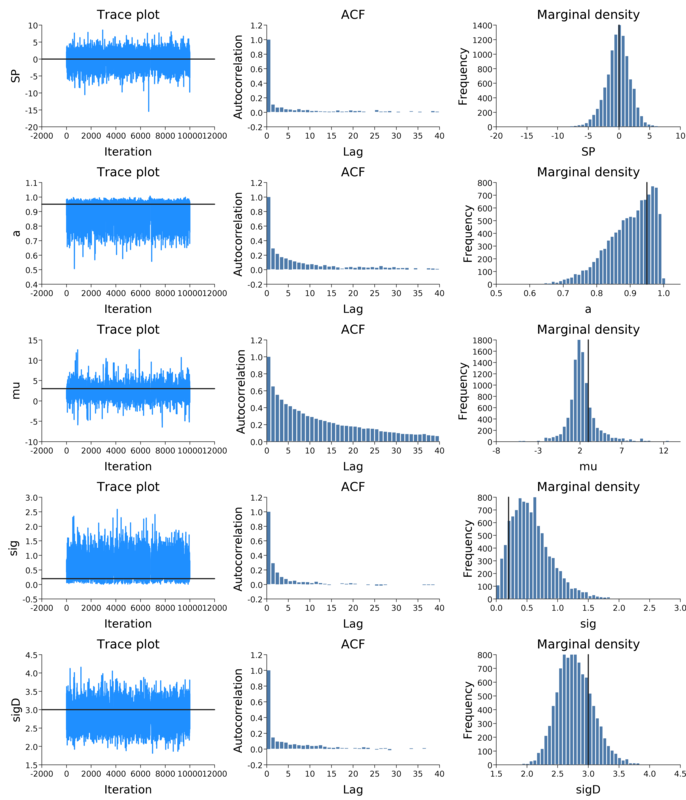 Note that I briefly discussed this kind of pure functional approach to describing probabilistic programs (using Rand from Breeze) in my post on MCMC as a stream. Now we have our probabilistic program, we can sample from it using HMC as follows. The argument to HMC() is the number of leapfrog steps to take per iteration. Finally, we can use EvilPlot to look at the HMC output and check that we have managed to reasonably recover the true parameters associated with our synthetic data. Everything looks good, and the sampling is very fast! For further information, see the Rainier repo. In particular, start with the tour of Rainier’s core, which gives a more detailed introduction to how Rainier works than this post. Those interested in how the efficient AD works may want to read about the compute graph, and the implementation notes explain how it all fits together. There is some basic ScalaDoc for the core package, and also some examples (including this one), and there’s a gitter channel for asking questions. This is a very new project, so there are a few minor bugs and wrinkles in the initial release, but development is progressing rapidly, so I fully expect the library to get properly battle-hardened over the next few months. For those unfamiliar with the monadic approach to probabilistic programming, then Ścibior et al (2015) is probably a good starting point. I’ve recently delivered a three-day intensive short-course on Scala for statistical computing and data science. The course seemed to go well, and the experience has convinced me that Scala should be used a lot more by statisticians and data scientists for a range of problems in statistical computing. In particular, the simplicity of writing fast efficient parallel algorithms is reason alone to take a careful look at Scala. With a view to helping more statisticians get to grips with Scala, I’ve decided to freely release all of the essential materials associated with the course: the course notes (as PDF), code fragments, complete examples, end-of-chapter exercises, etc. Although I developed the materials with the training course in mind, the course notes are reasonably self-contained, making the course quite suitable for self-study. At some point I will probably flesh out the notes into a proper book, but that will probably take me a little while. I’ve written a brief self-study guide to point people in the right direction. For people studying the material in their spare time, the course is probably best done over nine weeks (one chapter per week), and this will then cover material at a similar rate to a typical MOOC. For anyone frustrated by the limitations of dynamic languages such as R, Python or Octave, this course should provide a good pathway to an altogether more sophisticated, modern programming paradigm. People regularly ask me about books and other resources for getting started with Scala for statistical computing and data science. This post will focus on books, but it’s worth briefly noting that there are a number of other resources available, on-line and otherwise, that are also worth considering. I particularly like the Coursera course Functional Programming Principles in Scala – I still think this is probably the best way to get started with Scala and functional programming for most people. In fact, there is an entire Functional Programming in Scala Specialization that is worth considering – I’ll probably discuss that more in another post. I’ve got a draft page of Scala links which has a bias towards scientific and statistical computing, and I’m currently putting together a short course in that area, which I’ll also discuss further in future posts. But this post will concentrate on books. Before one can dive into statistical computing and data science using Scala, it’s a good idea to understand a bit about the language and about functional programming. There are by now many books on Scala, and I haven’t carefully reviewed all of them, but I’ve looked at enough to have an idea about good ways of getting started. Programming in Scala: Third edition, Odersky et al, Artima. This is the Scala book, often referred to on-line as PinS. It is a weighty tome, and works through the Scala language in detail, starting from the basics. Every serious Scala programmer should own this book. However, it isn’t the easiest introduction to the language. Scala for the Impatient, Horstmann, Addison-Wesley. As the name suggests, this is a much quicker and easier introduction to Scala than PinS, but assumes reasonable familiarity with programming in general, and sort-of assumes that the reader has a basic knowledge of Java and the JVM ecosystem. That said, it does not assume that the reader is a Java expert. My feeling is that for someone who has a reasonable programming background and a passing familiarity with Java, then this book is probably the best introduction to the language. Note that there is a second edition in the works. Functional Programming in Scala Chiusano and Bjarnason, Manning. It is possible to write Scala code in the style of "Java-without-the-semi-colons", but really the whole point of Scala is to move beyond that kind of Object-Oriented programming style. How much you venture down the path towards pure Functional Programming is very much a matter of taste, but many of the best Scala programmers are pretty hard-core FP, and there’s probably a reason for that. But many people coming to Scala don’t have a strong FP background, and getting up to speed with strongly-typed FP isn’t easy for people who only know an imperative (Object-Oriented) style of programming. This is the book that will help you to make the jump to FP. Sometimes referred to online as FPiS, or more often even just as the red book, this is also a book that every serious Scala programmer should own (and read!). Note that is isn’t really a book about Scala – it is a book about strongly typed FP that just "happens" to use Scala for illustrating the ideas. Consequently, you will probably want to augment this book with a book that really is about Scala, such as one of the books above. Since this is the first book on the list published by Manning, I should also mention how much I like computing books from this publisher. They are typically well-produced, and their paper books (pBooks) come with complimentary access to well-produced DRM-free eBook versions, however you purchase them. Functional and Reactive Domain Modeling, Ghosh, Manning. This is another book that isn’t really about Scala, but about software engineering using a strongly typed FP language. But again, it uses Scala to illustrate the ideas, and is an excellent read. You can think of it as a more practical "hands-on" follow-up to the red book, which shows how the ideas from the red book translate into effective solutions to real-world problems. Structure and Interpretation of Computer Programs, second edition Abelson et al, MIT Press. This is not a Scala book! This is the only book in this list which doesn’t use Scala at all. I’ve included it on the list because it is one of the best books on programming that I’ve read, and is the book that I wish someone had told me about 20 years ago! In fact the book uses Scheme (a Lisp derivative) as the language to illustrate the ideas. There are obviously important differences between Scala and Scheme – eg. Scala is strongly statically typed and compiled, whereas Scheme is dynamically typed and interpreted. However, there are also similarities – eg. both languages support and encourage a functional style of programming but are not pure FP languages. Referred to on-line as SICP this book is a classic. Note that there is no need to buy a paper copy if you like eBooks, since electronic versions are available free on-line. Scala for Data Science, Bugnion, Packt. Not to be confused with the (terrible) book, Scala for machine learning by the same publisher. Scala for Data Science is my top recommendation for getting started with statistical computing and data science applications using Scala. I have reviewed this book in another post, so I won’t say more about it here (but I like it). Scala Data Analysis Cookbook, Manivannan, Packt. I’m not a huge fan of the cookbook format, but this book is really mis-named, as it isn’t really a cookbook and isn’t really about data analysis in Scala! It is really a book about Apache Spark, and proceeds fairly sequentially in the form of a tutorial introduction to Spark. Spark is an impressive piece of technology, and it is obviously one of the factors driving interest in Scala, but it’s important to understand that Spark isn’t Scala, and that many typical data science applications will be better tackled using Scala without Spark. I’ve not read this book cover-to-cover as it offers little over Scala for Data Science, but its coverage of Spark is a bit more up-to-date than the Spark books I mention below, so it could be of interest to those who are mainly interested in Scala for Spark. Scala High Performance Programming, Theron and Diamant, Packt. This is an interesting book, fundamentally about developing high performance streaming data processing algorithm pipelines in Scala. It makes no reference to Spark. The running application is an on-line financial trading system. It takes a deep dive into understanding performance in Scala and on the JVM, and looks at how to benchmark and profile performance, diagnose bottlenecks and optimise code. This is likely to be of more interest to those interested in developing efficient algorithms for scientific and statistical computing rather than applied data scientists, but it covers some interesting material not covered by any of the other books in this list. Learning Spark, Karau et al, O’Reilly. This book provides an introduction to Apache Spark, written by some of the people who developed it. Spark is a big data analytics framework built on top of Scala. It is arguably the best available framework for big data analytics on computing clusters in the cloud, and hence there is a lot of interest in it. The book is a perfectly good introduction to Spark, and shows most examples implemented using the Java and Python APIs in addition to the canonical Scala (Spark Shell) implementation. This is useful for people working with multiple languages, but can be mildly irritating to anyone who is only interested in Scala. However, the big problem with this (and every other) book on Spark is that Spark is evolving very quickly, and so by the time any book on Spark is written and published it is inevitably very out of date. It’s not clear that it is worth buying a book specifically about Spark at this stage, or whether it would be better to go for a book like Scala for Data Science, which has a couple of chapters of introduction to Spark, which can then provide a starting point for engaging with Spark’s on-line documentation (which is reasonably good). Advanced Analytics with Spark, Ryza et al, O’Reilly. This book has a bit of a "cookbook" feel to it, which some people like and some don’t. It’s really more like an "edited volume" with different chapters authored by different people. Unlike Learning Spark it focuses exclusively on the Scala API. The book basically covers the development of a bunch of different machine learning pipelines for a variety of applications. My main problem with this book is that it has aged particularly badly, as all of the pipelines are developed with raw RDDs, which isn’t how ML pipelines in Spark are constructed any more. So again, it’s difficult for me to recommend. The message here is that if you are thinking of buying a book about Spark, check very carefully when it was published and what version of Spark it covers and whether that is sufficiently recent to be of relevance to you. There are lots of books to get started with Scala for statistical computing and data science applications. My "bare minimum" recommendation would be some generic Scala book (doesn’t really matter which one), the red book, and Scala for data science. After reading those, you will be very well placed to top-up your knowledge as required with on-line resources. Scala for Data Science, Bugnion, Packt, 2016. Disclaimer: This book review has not been solicited by the publisher (or anyone else) in any way. I purchased the review copy of this book myself. I have not received any benefit from the writing of this review. On this blog I previously reviewed the (terrible) book, Scala for machine learning by the same publisher. I was therefore rather wary of buying this book. But the topic coverage looked good, so I decided to buy it, and wasn’t disappointed. Scala for Data Science is my top recommendation for getting started with statistical computing and data science applications using Scala. The book assumes a basic familiarity with programming in Scala, at around the level of someone who has completed the Functional Programming Principles in Scala Coursera course. That is, it (quite sensibly) doesn’t attempt to teach the reader how to program in Scala, but rather how to approach the development of data science applications using Scala. It introduces more advanced Scala idioms gradually (eg. typeclasses don’t appear until Chapter 5), so it is relatively approachable for those who aren’t yet Scala experts. The book does cover Apache Spark, but Spark isn’t introduced until Chapter 10, so it isn’t “just another Spark book”. Most of the book is about developing data science applications in Scala, completely independently of Spark. That said, it also provides one of the better introductions to Spark, so doubles up as a pretty good introductory Spark book, in addition to being a good introduction to the development of data science applications with Scala. It should probably be emphasised that the book is very much focused on data science, rather than statistical computing, but there is plenty of material of relevance to those who are more interested in statistical computing than applied data science. Manipulating data with Breeze – Breeze is the standard Scala library for scientific and statistical computing. It’s pretty good, but documentation is rather lacking. This Chapter provides a good tutorial introduction to Breeze, which should be enough to get people going sufficiently to be able to make some sense of the available on-line documentation. Plotting with breeze-viz – Breeze has some support for plotting and visualisation of data. It’s somewhat limited when compared to what is available in R, but is fine for interactive exploratory analysis. However, the available on-line documentation for breeze-viz is almost non-existent. 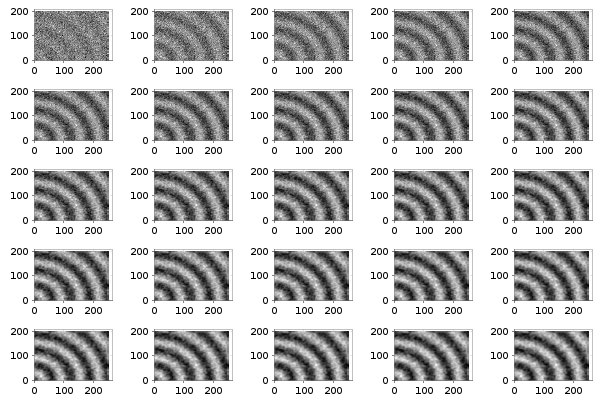 This Chapter is the best introduction to breeze-viz that I have seen. Parallel collections and futures – the Scala standard library has built-in support for parallel and concurrent programming based on functional programming concepts such as parallel (monadic) collections and Futures. Again, this Chapter provides an excellent introduction to these powerful concepts, allowing the reader to start developing parallel algorithms for multi-core hardware with minimal fuss. Slick – a functional interface for SQL – an introduction to the Slick library for a more Scala-esque way of database interfacing. Web APIs – the practicalities of talking to web APIs. eg. authenticated HTTP requests and parsing of JSON responses. Concurrency with Akka – Akka is the canonical implementation of the actor model in Scala, for building large concurrent applications. It is the foundation on which Spark is built. Distributed batch processing with Spark – a tutorial introduction to Apache Spark. Spark is a big data analytics framework built on top of Scala and Akka. It is arguably the best available framework for big data analytics on computing clusters in the cloud, and hence there is a lot of interest in it. Indeed, Spark is driving some of the interest in Scala. Spark SQL and DataFrames – interfacing with databases using Spark, and more importantly, an introduction to Spark’s DataFrame abstraction, which is now fundamental to developing machine learning pipelines in Spark. Distributed machine learning with MLLib – MLLib is the machine learning library for Spark. It is worth emphasising that unlike many early books on Spark, this chapter covers the newer DataFrame-based pipeline API, in addition to the original RDD-based API. Together, Chapters 10, 11 and 12 provide a pretty good tutorial introduction to Spark. After working through these, it should be easy to engage with the official on-line Spark documentation. Web APIs with Play – is concerned with developing a web API at the end of a data science pipeline. Visualisation with D3 and the Play framework – is concerned with integrating visualisation into a data science web application. This book provides a good tutorial introduction to a large number of topics relevant to statisticians and data scientists interested in developing data science applications using Scala. After working through this book, readers should be well-placed to augment their knowledge with readily searchable on-line documentation. In a follow-up post I will give a quick overview of some other books relevant to getting started with Scala for statistical computing and data science.